Honored to be on the 2018 YBCA 100 List alongside empowering artists like Janelle Monåe, Ilana Glazer + Abbi Jacobson, Lena Waithe, and Tarana Burke, founder of the #MeToo Movement. My most recent short, "Backpedals", will be premiering at the Short. Sweet. Film. Fest in Cleveland, OH on Saturday, March 3rd. My short film, "Céline", which just screened in France in the Cannes Court Métrage of the 2017 Cannes Film Festival. The film was created with a 100% female crew. It has also screened at the Short. Sweet. Film Fest and won a "Women Filmmaker" Award at the Accolade Global Film Competition. "Céline" will be screening at the 2017 Cannes Short Film Corner from May 22-28th. I will be traveling to France to attend the festival. "From My Head To Hers" has won the "Google Breakthrough in Technology Award" at the San Francisco International Film Festival. The award is described as an honor to filmmakers who go the extra mile to highlight the use of technology to solve a problem and make the world a better place, and aspires to promote diversity in tech while disrupting negative stereotypes. Starting this week, I will be an intern at both Village Roadshow Pictures and ImageMovers. Village Roadshow is located a block away from Beverly Hills. Some of their films include The Great Gatsby, The Matrix trilogy, and American Sniper. ImageMovers is Robert Zemeckis' production company, which is located on the backlots of Universal Studios. Some of their films include Cast Away, The Polar Express, and Flight. "From My Head To Hers" has been selected to screen at the New York City Student Film Showcase on January 9th at the Producer's Club in NYC (located 2 blocks away from Times Square). It is a part of a screening series fort he Big Apple Film Festival. "From My Head To Hers" won "Best Direction" at the Atlanta Independent Film Festival. It was also nominated for "best Cinematography" as well as "Best Editing". • "Golden Lion Award - Alternative" - Who Are You? After being accepted into both of my top choice schools, The University of Southern California School of Cinematic Arts and New York University Tisch School of the Arts. This was a very tough decision, but I decided to commit to USC! I am so excited to move to LA in the fall + major in Film & Television Production as the Class of 2019. "The Waiting Game" is an official selection for the Reality Bytes Independent Student Film Festival! I have been accepted to Northwestern University to study Radio / Television / Film at their School of Communication. I have been accepted to Boston University to study Film & Television Production at their College of Communication. I have been accepted to the California Institute of the Arts to study Film and Video Production! I was just notified that I have been accepted to Chapman University as a Dean's Scholar, which means that I will receive a $15,000 scholarship annually! I have been accepted to Loyola Marymount University to study Film and Television Production! I HAVE BEEN ACCEPTED INTO CHAPMAN UNIVERSITY!!! It is located in Orange County, California. If I attend, I will be studying Film Production at Dodge College of Film and Media Arts. The acceptance rate into my major is 15%! I'm waiting to hear back about if I have received any scholarships. My next short film, "Between You and Me", will be live on the website on January 31st. 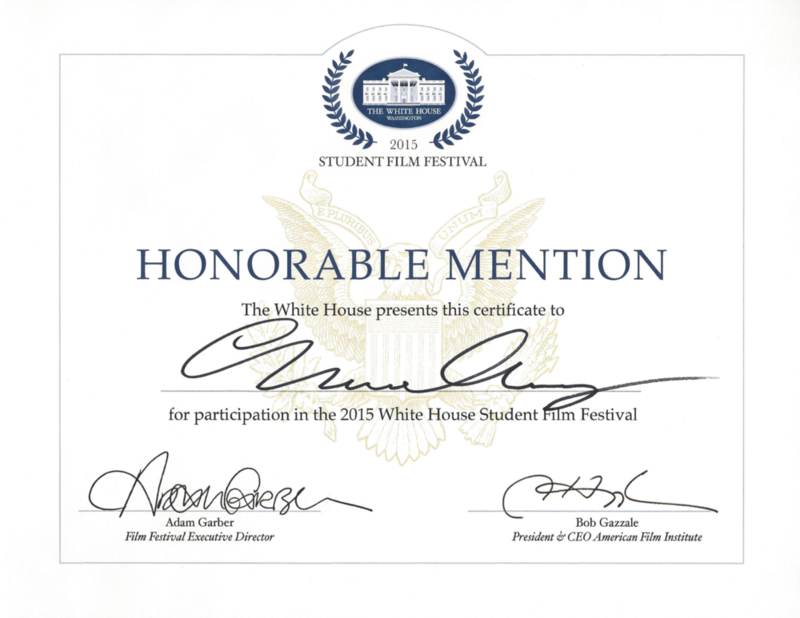 It relates to the importance of service and giving back, and was made specifically for the White House Film Festival. 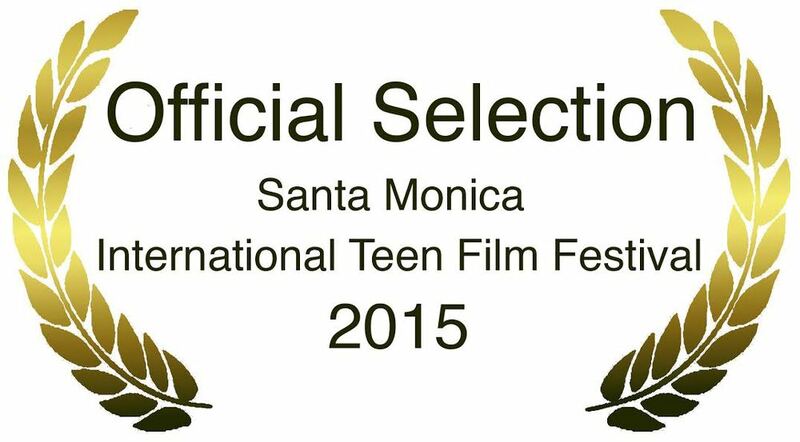 My short film, "Supernova", has been selected to screen at the Short. Sweet. Film Fest in Cleveland, OH. My short film, "The Waiting Game" just screened at the 12th Annual Standing Rock International Shorts Festival in Kent, Ohio. This is the 5-minute cut version of a film I have previously uploaded, but this is what I am using for all my college applications (USC, NYU, LMU, Emerson) and it was cut down to 5 minutes and I got better audio and changed a couple of songs. My film, "The Waiting Game", won Best High School Docu-Drama at the 12th International Student Film Festival Hollywood! I won Best High School Experimental at this festival last year as well. I got nominated for "Rising Female Star" and "Best Cinematography" at the All American High School Film Festival! What an amazing weekend - I got so meet so many other kids into the exact field as I am as well as meet up with an admissions counselor from UCLA and visit the NYU campus! The Waiting Game won Best High School Film @ WSU Moving Media Film Festival! Four of my films have been selected to be screened at the All American High School Film Festival in NYC! -Los Angeles Film Festival: My short film, the Waiting Game, will be screened on June 14th in Los Angeles through the Los Angeles Film Festival! -iMagine Film Festival: "The Waiting Game" has won "Best Overall Film" and "Best Drama", while "Carrie's Wish" won "2nd Drama" and "Who Are You" won "Best Miscellaneous".